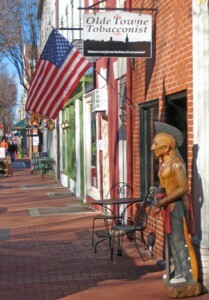 Come on down and see us, you’re sure to enjoy yourself in historic downtown Fredericksburg, Virginia. Sit and relax in our tobacco shop or walk the streets of this historic Civil War city, while enjoying your favorite smoke. We are right across the street from the Visitor’s Center so you can’t miss us. Stop by today and see what we have to offer for everyone. We carry a complete selection of cigars, pipes and pipe tobaccos sure to please everyone. You’ll find lots of unique accessories & gifts too. If there is anything specific that you are looking for, be sure to stop by, give us a call or send us an email.